The natural beauty and charisma of Los Cabos meets luxury accommodations and world-class amenities at this fine beachfront resort. Set right on a pristine beach just five minutes from downtown Cabo San Lucas, the 5 Star Cabo Resort offers the perfect blend of location, intimacy, relaxation, and recreational activities. You’ll find plenty of ways to enjoy yourself here, from the sparkling beachfront pools and whale slide to the European-style spa and fitness club. 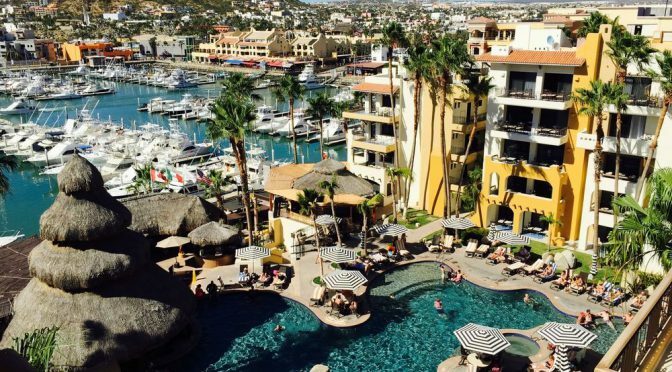 This 5 Star Cabo Resort is full service and more: there’s a full spa, fitness clubs, two restaurants, art galleries and jewelry shops, a pharmacy, a market even scooter rentals and horseback riding! There’s so much to see and do that you might not even leave the resort. Tempt your taste buds with a wide range of possibilities at the newly renovated 5 Star Cabo Resort . Find your culinary bliss by indulging in casual American cuisine, traditional Mexican cuisine or exotic dishes inspired by the flavors of Europe. Venues range from outdoor dining with stunning seaside views to charming and elegant indoor eateries.